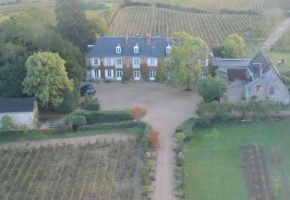 Some of our best wine moments are totally unexpected and yesterday we had a lovely surprise when we visited Domaine Leduc-Frouin with our clients. I’d mentioned to Nathalie Leduc that our clients were from Dallas, Texas, that they were visiting a friend living in Paris and that the purpose of their trip to the Loire was to celebrate a 40th birthday. It’s always nice for our partner growers to have a little information up front and also for our clients who are always warmly welcomed. 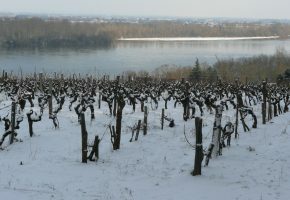 It was a beautiful sunny day here in the Loire. Cold and crisp but with bright blue skies, we enjoyed having a look in the winery and pottering around before returning to the tasting room. The village of Sousigné is on a seam of Falun – younger than the classic Tuffeau limestone of the region and very different to look at with its millions of tiny crushed sea shells marking out very defined, jagged layers in the hillsides from which the old houses, buildings and more recently the wine storage rooms were hewn. 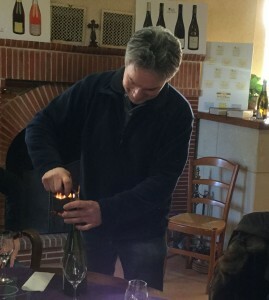 A fire in the tasting room was a welcome sight as we tasted through the range and then Antoine Leduc produced a mystery bottle – a bottle of 1976 Coteaux du Layon – the year of our client’s birth. I don’t know who was more delighted, him or me but it was a lovely surprise. I remember the summer of ’76. I was a teenager and remember cooling off in the garden with the hosepipe. It was hot and dry. I expected the wine to be softer and lacking acidity after all this time but not a bit. 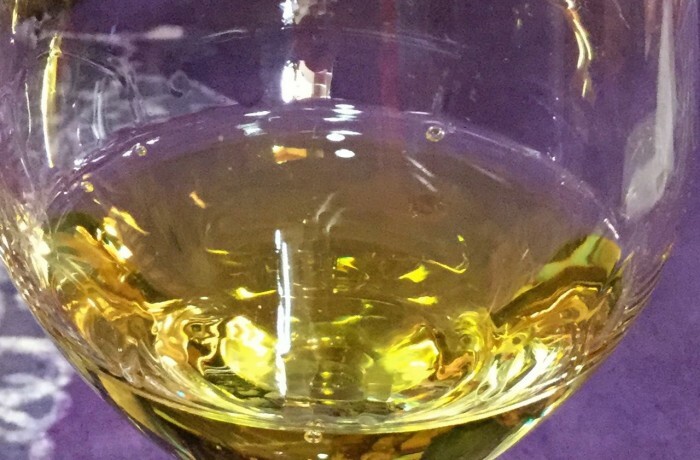 After 40 years it still has everything going for it – this wine is not going anywhere soon. Clean and fresh on the palate with lovely fruit – it’s true that these wines from the Layon can be kept for 40, 50, 60 even 100 years. 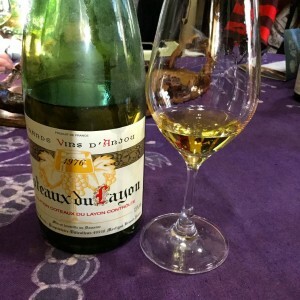 Sweet wines from the Coteaux du Layon appellation are made from the Chenin Blanc grape. Picked early, ripe, over ripe and affected by botrytis it’s capable of producing a whole range of wine styles including these delicious dessert wines that have the capacity to age for generations. 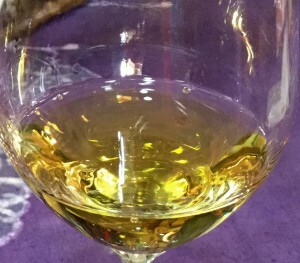 The Loire makes some of the best sweet wines in the world and many of our guests who are initially reluctant to taste them, leave the Loire completely blown away by the quality and elegance of these wines. Huge thanks to Nathalie and Antoine Leduc for giving us such a special tasting – one that we, and our guests won’t forget for a long time to come. In prefect condition and a delight to taste. Still with all its fruit and freshness, balance and acidity its luscious sweetness is delicious and the wine shows no hint of fatigue. 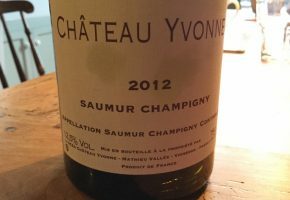 We’ve been working with Mathieu Vallée of Chateau Yvonne for the past 8 years and love his wines. 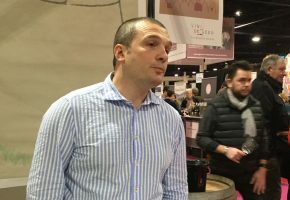 A former engineer, Mathieu took over Chateau Yvonne in 2007. 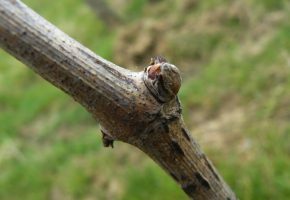 He has 28 small parcels dotted around the Saumur Champigny appellation (3ha of Chenin and 8ha of Cabernet Franc).